Good news Beast Wars fans! It looks like you'll get to enjoy Shout! 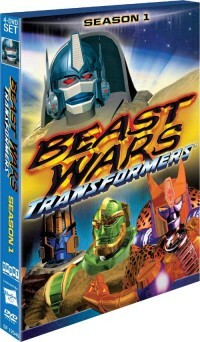 Factory's upcoming Beast Wars Season One boxset a little earlier than we first anticipated. TVShowsonDVD is reporting the release date has been moved up from June 14th to June 7th, and the Amazon preorder agrees. If they were doing Blu-ray, I'd snap it up in a second. I'll have to wait to see the packaging and extras before I make a decision. I do like the boxart, though. Bravo. Ho ho, man, I can't wait for this! This is great news. No more trolling Ebay looking for those incredibly-overpriced Rhino sets! So what are the odds of this being released as region 2? 4,751 pages were recently viewed by 835 unique visitors. This page was viewed 1 times on Thursday, April 25th 2019 9:33am CDT. © 2019 Seibertron, Inc. DBA Seibertron.com. All Rights Reserved. Established June 2000. Seibertron.com is owned by Ryan Yzquierdo.